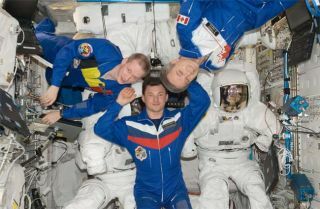 European Space Agency astronaut Frank De Winne (right), Expedition 21 commander; along with Russian cosmonaut Roman Romanenko (center) and Canadian Space Agency astronaut Robert Thirsk, both flight engineers, pose for a photo on the International Space Station. This story was updated at 2:41 a.m. EST. A Canadian, a Russian and a Belgian astronaut left theInternational Space Station and landed on the icy steppes of Kazakhstan Tuesdayaboard a Russian Soyuz spacecraft. Belgian astronaut FrankDeWinne, Russian cosmonaut Roman Romanenko and Canadian astronaut BobThirsk touched down in their Soyuz TMA-15 crew capsule at 2:15 a.m. EST (0715GMT) after heavy parachutes slowed the craft's descent. The landing went smoothly, though the subzero temperaturesin Kazakhstan prevented helicopters from flying to retrieve the crew as usual.Instead, the Russian Federal Space Agency sent teams in all-terrain vehicles torecover the spaceflyers. The three crewmembers are finishing a six-month tour of dutyon theorbiting laboratory. When their spacecraft left the outpost theirExpedition 21 mission officially ended and the new Expedition 22 began. DeWinne served as the first station commander representingthe European Space Agency. "As the first European commander, it has been a greathonor to be able to fulfill this role, and I could have only done this thanksto the help of my colleagues," DeWinne said during a change-of-commandceremony Nov. 24, when he handed over control of the station to NASAastronaut Jeff Williams. The station is now down to a barebonescrew of two ? Williams and Russian cosmonaut Maxim Suraev ? for a period ofabout three weeks. The departing crewmembers said they were eager to be back onthe ground. "I miss my family most of all, of course," Thirsksaid during an in-flight news conference last week. "I am already dreamingof those first hugs when I see my family in Moscow. After that is nature. I missthe wind; I miss the sunlight, the smell of flowers, and freshly cut grass." The spaceflyers said they became close during the longmonths living and working together in close quarters. "I really appreciate my friends," Romanenko saidof his crewmates. "We had a very good time together, we had a very good experienceduring our six-month flight." Romanenko is the son of veteran cosmonaut Yuri Romanenko,who commanded three space missions in the 1970s and 1980s. During their 186 days on the station, DeWinne, Romanenko andThirsk saw the addition of a new science porch on the station's Japanese Kibolaboratory, the arrival of the first Japanese unmanned cargo ship, called HTV,and the addition of the new Russian Poisk module to the station. During their tenure three space shuttle flights visited thestation to deliver new parts and equipment, and at one point a record threeSoyuz spacecraft were simultaneously docked at the outpost. Thirsk said a highlight was the HTVmission to deliver food, computers and other supplies. The flight representedthe first flight of the untried vehicle. "The most exciting moment was the arrival of the HTVJapanese cargo vehicle," Thirsk said. "That went off perfectly."